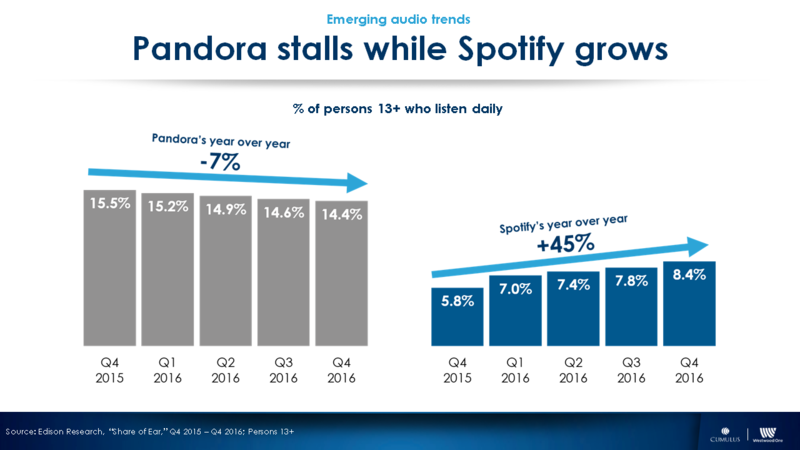 Pandora is dropping: For the last five quarters, Pandora’s audience has been diminishing. Meanwhile, on-demand competitor Spotify is flourishing with +45% year over year growth. Consumers’ increasing desire for greater choice and control may explain Pandora’s decline. 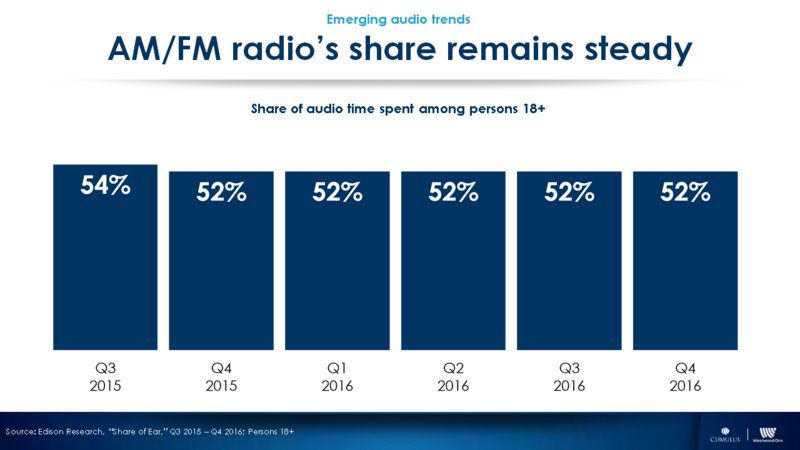 AM/FM radio is stable: As the centerpiece of American audio, AM/FM radio’s share of audio time spent has remained steady quarter after quarter. 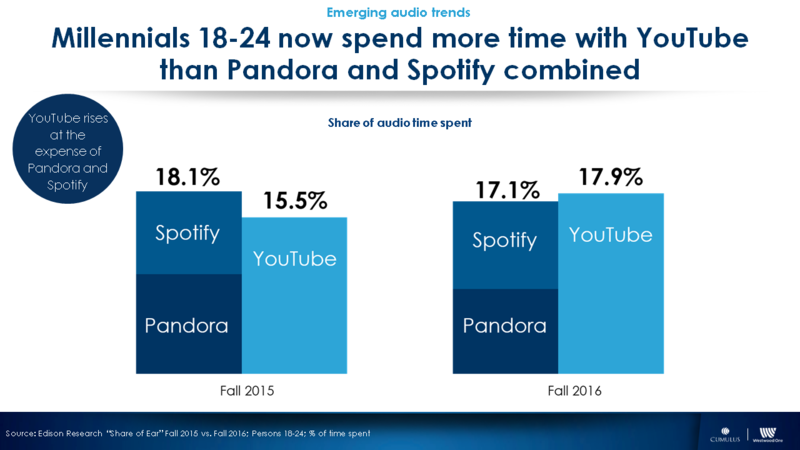 YouTube beats Pandora and Spotify among persons 18-24: In Fall 2016, YouTube outperformed Spotify and Pandora combined in share of time spent with audio. Over the last year, YouTube has seen a 15% increase, while the combined Millennial 18-24 share of Pandora and Spotify has dropped. 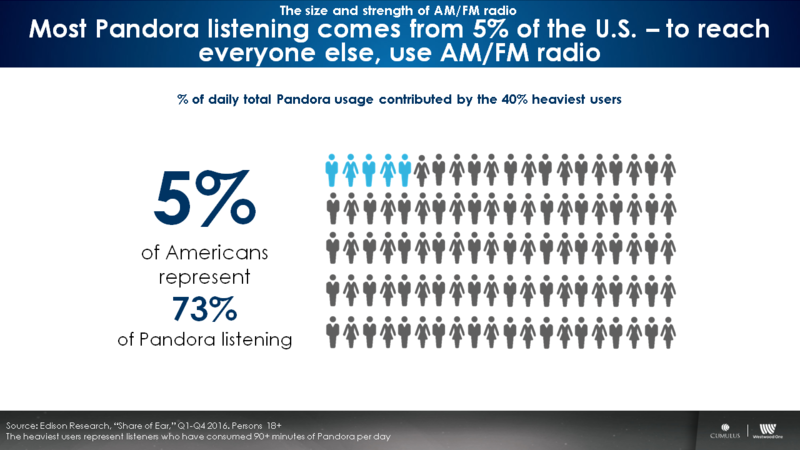 Most of America isn’t listening to Pandora: 73% of Pandora listening comes from only 5% of Americans. Most of the country is listening to other audio platforms. Advertisers need a mass reach media like AM/FM radio to hit the largest number of listeners. 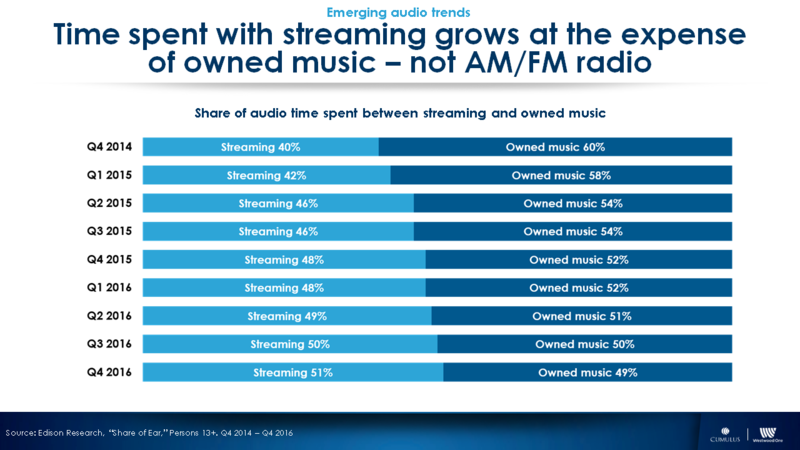 Streaming grows at the expense of owned music, not AM/FM radio: Many assume streaming audio’s growth is coming at the expense of AM/FM radio. Not true. Streaming growth is coming out of time spent with owned music. In Q4 2016, streaming overtakes owned music in share of audio time spent. Meanwhile, AM/FM radio’s share of audio time spent remains steady. AM/FM radio is a reliable medium to deliver consumers for brands. With the Academy of Country Music Awards coming up this Sunday, we take a look at this community-driven audience to better understand where they come from and what’s important to them. 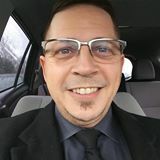 This desirable advertiser audience of community-driven listeners resides primarily in the central region of the United States. 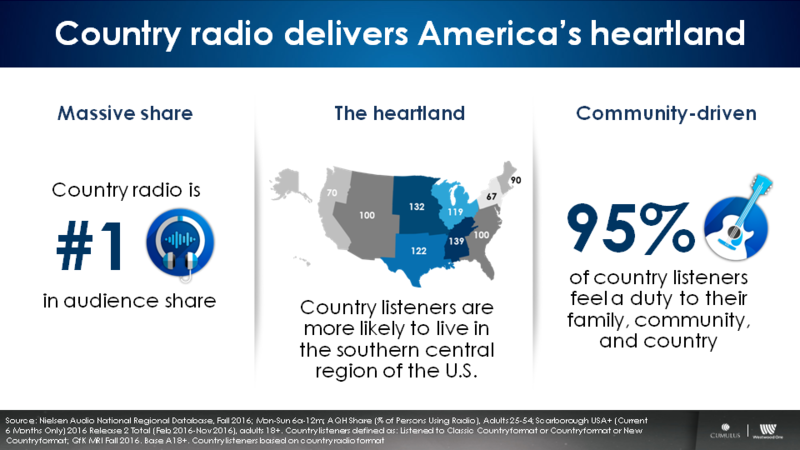 Country is America’s radio format, owning airwaves and the heartland with massive share.